On my morning walk today, I plugged my earphones into a compilation of oldies, very oldies. The music of my youth always puts a beat in my walk. And the memories…oh, the memories. 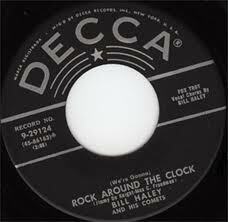 This one started with Rock Around the Clock, a hit when I was in grade school. I got a pink clock radio for Christmas when I was in about 5th grade, the coolest thing ever, next to my record player that played 45s. I could listen to all this music in the peace of my room. 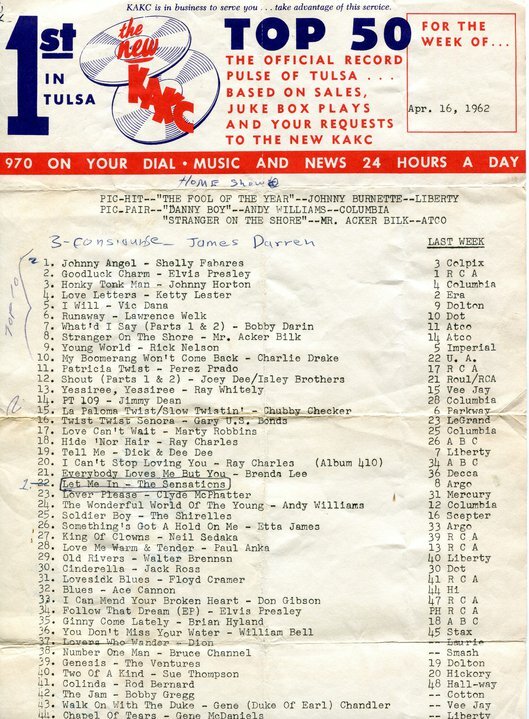 That doesn’t sound like much to generations who grew up with their personal music everywhere they went, but all we had were radios and car radios and records. 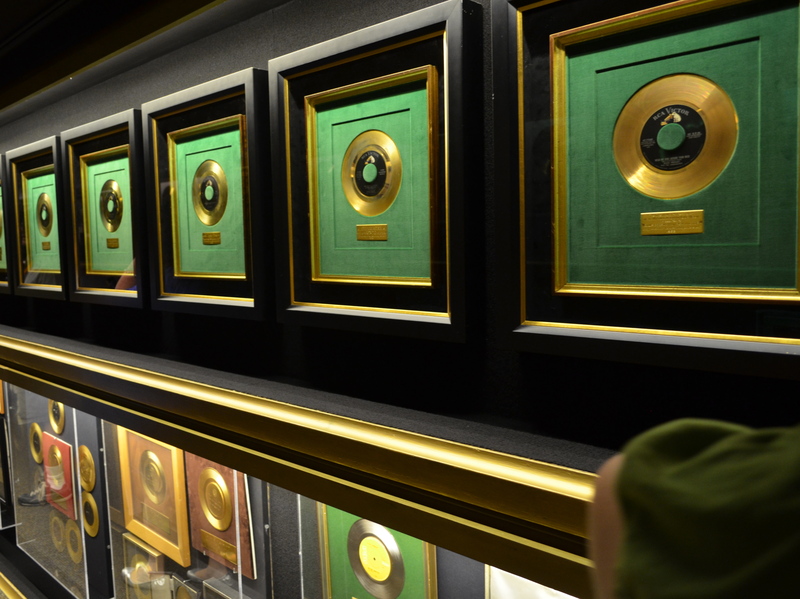 Real records. I lived in some prehistoric age obviously. 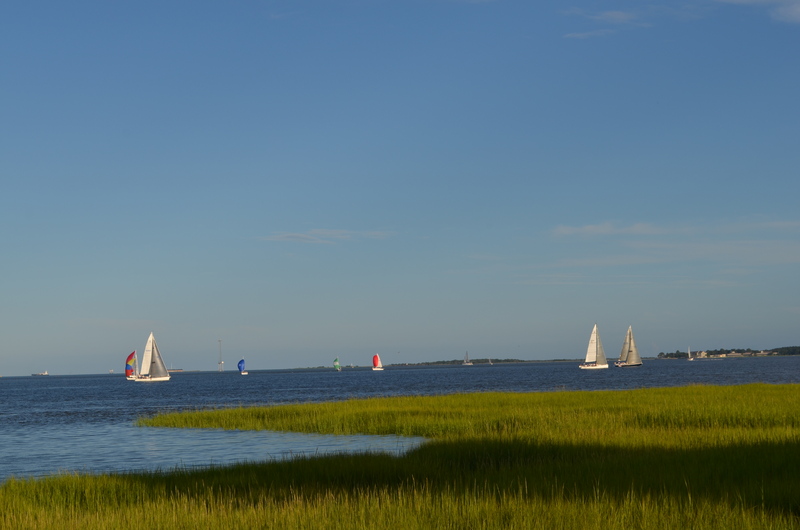 My trip through the South a couple of weeks ago led me through several of the most important cities of the region, all of them located by water. Friends have asked me which one I liked best…it’s hard to say because they’re all so unique. There is definitely something about these places, something shaped by the flow of the rivers, the people who first settled on the banks or shores and all the stories that have flowed through history until now. My impressions are quick, not based on long stays, postcard impressions of cities, some seen for the first time, one of them much loved already. I had the advantage of seeing them all in two weeks, so my thoughts are fresh for each of them. 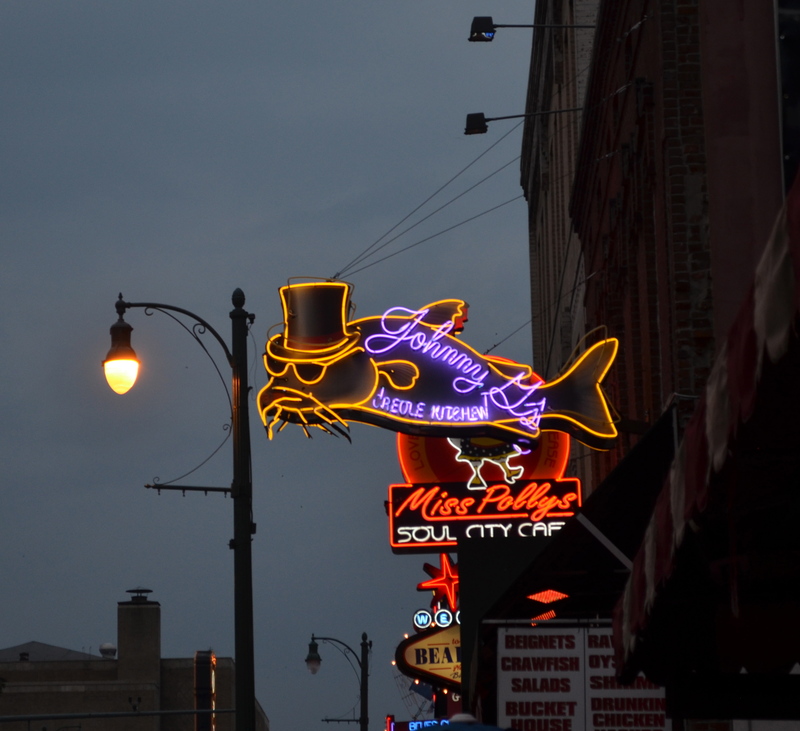 The first day, we drove to Memphis, crossing the mighty Mississippi to enter the city. I’d been there a couple of times before, but just passing through, not long enough to even have an impression. 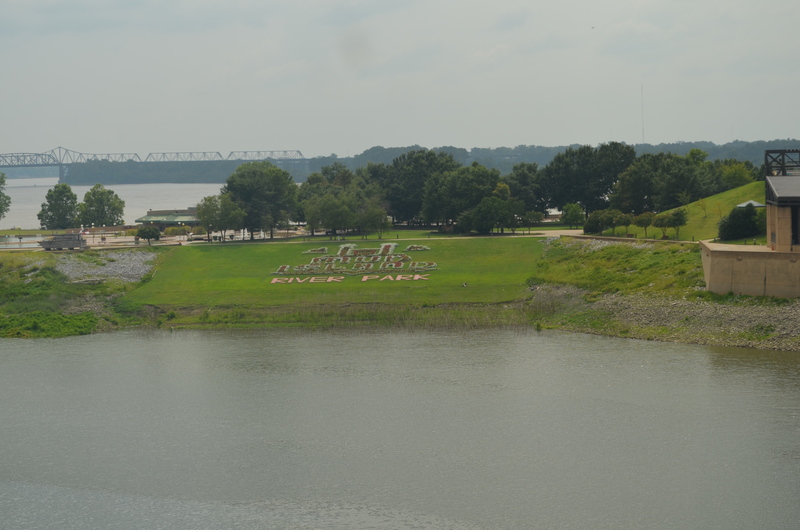 This time, we started at Mud Island, a peninsula with an incredibly creative scale model of the Mississippi River that you can walk along or in, seeing all the twists and turns, changing depths, and cities along its banks. There is also a museum with a history of the river that gives a good overview. Mud Island is a nice way to spend a few hours in a beautiful river park. You can think of Tom Cruise running through the tram in “The Firm” as you cross over to the park. This was my favorite neon sign of the night. Our travels took us to some smaller river cities with their own charm. 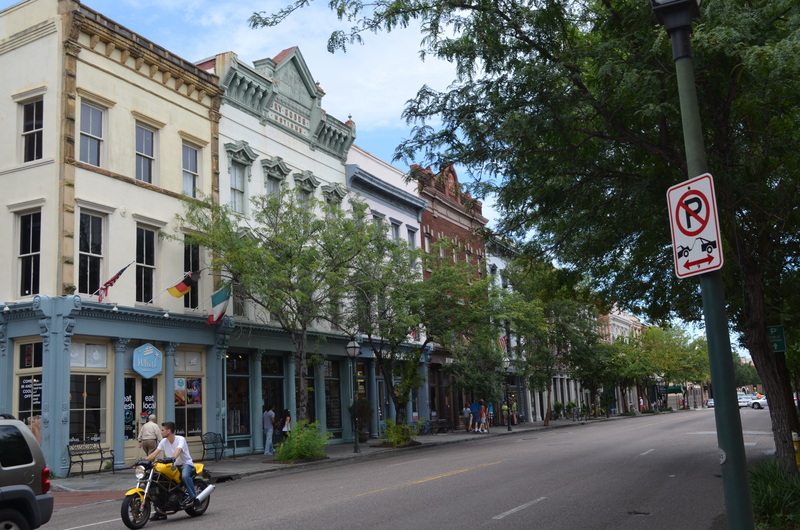 Paducah, Kentucky is an important stop on the Mississippi and is working to populate their historic district. Owensboro, Kentucky is on the Green River and has one of the most beautiful river parks I’ve seen next to their historic district. We found it by accident while off the highway looking for breakfast on a Sunday morning. 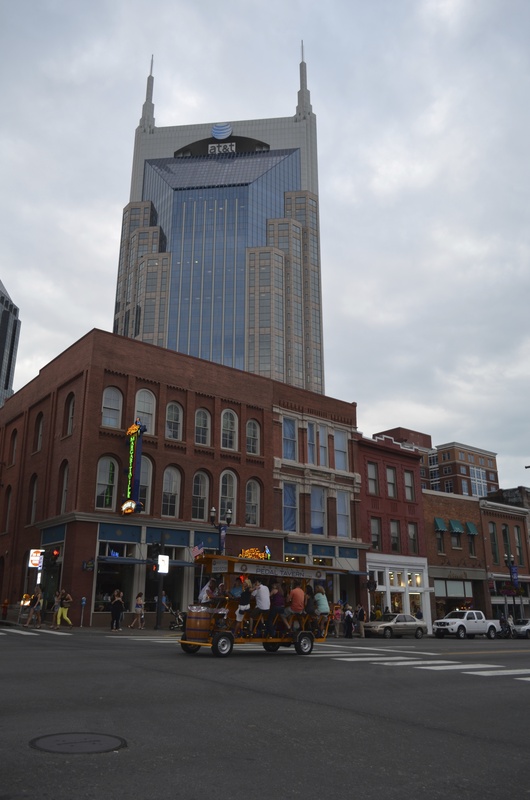 Our next city stop was Nashville. This was really a stopover, partially due to curiosity after watching the views shown in the television show. It was Sunday night and there was definitely a party atmosphere on Broadway. We had driven around, very impressed by the city, and stopped to walk and find a place to eat. There were restaurants everywhere, mostly chains which we wanted to avoid. There was also a cover charge to eat when there was music. 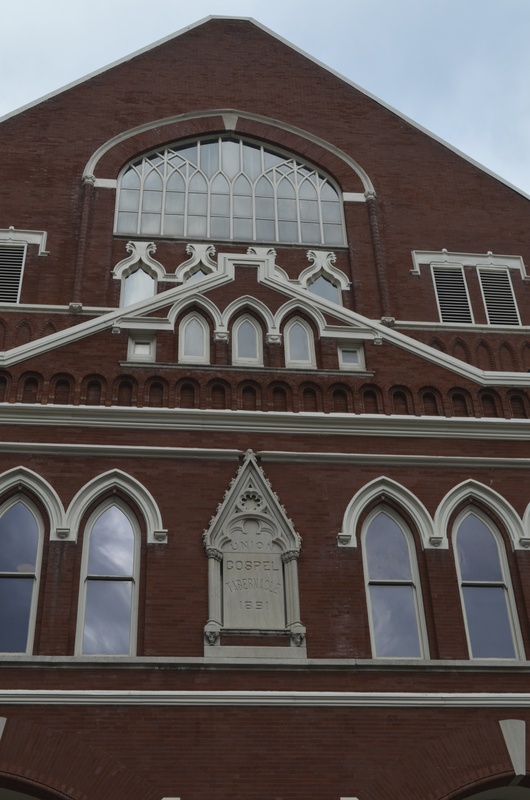 We found the Ryman Auditorium, the original home of the Grand Ole Opry. and walked up and down the street taking in the music coming from every bar along the way. My impression was that this really is music city with the happening street backed by the skyscrapers indicating the industries that thrive there. 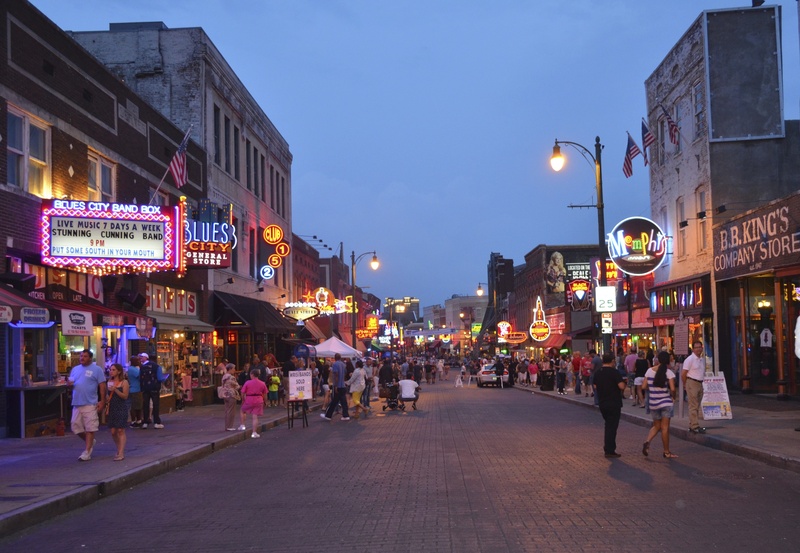 Nashville is cool, a fun place to visit and a beautiful city. 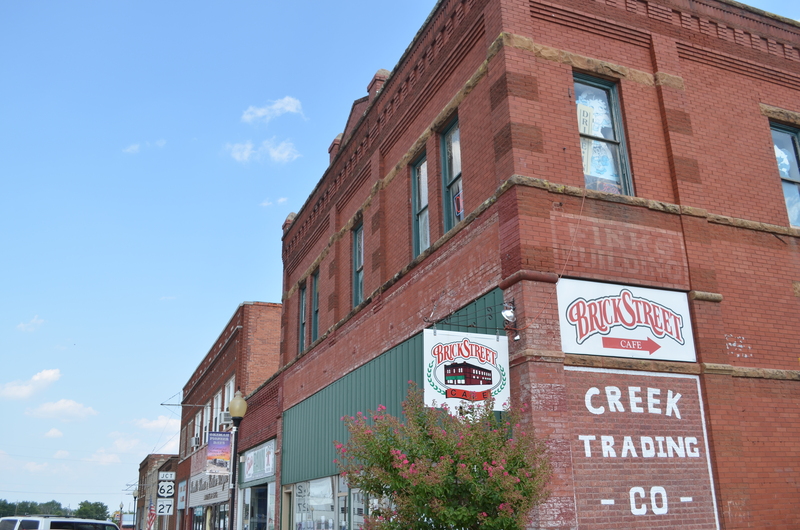 We never did find a place to eat, settling for homemade ice cream at an old parlor on the edge of Broadway. 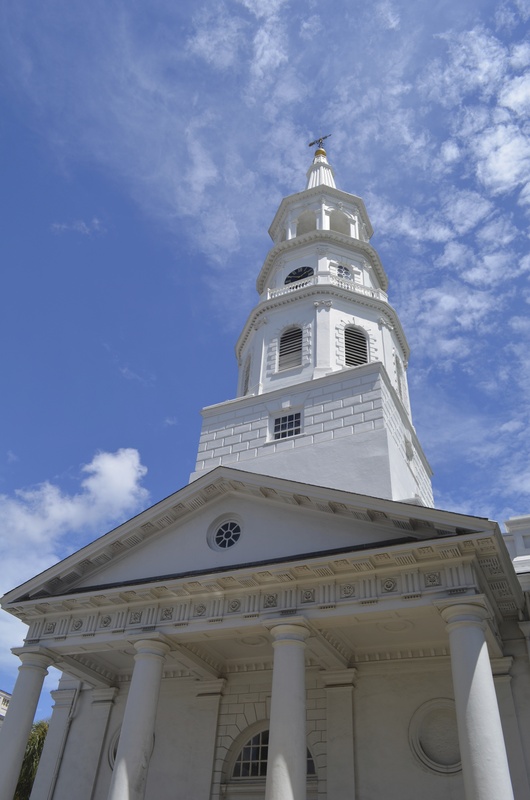 You can easily picture life in this city from Revolutionary times through the Civil War to now. 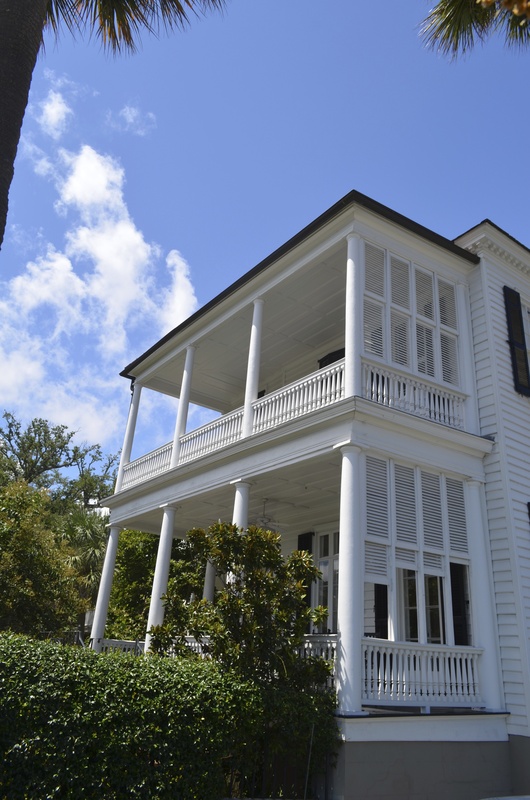 Their historic preservation efforts are exceptional and well rewarded. 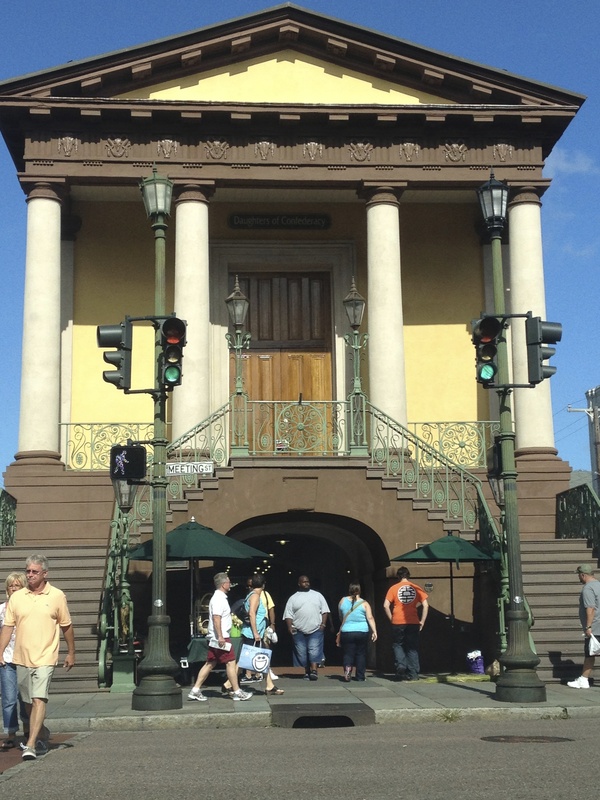 The City Market was fun to browse through the classy souvenirs…regional food, beautiful books, paintings, the ladies of the islands with their sweetgrass baskets, along with t-shirts and other fun things to remember your stay. 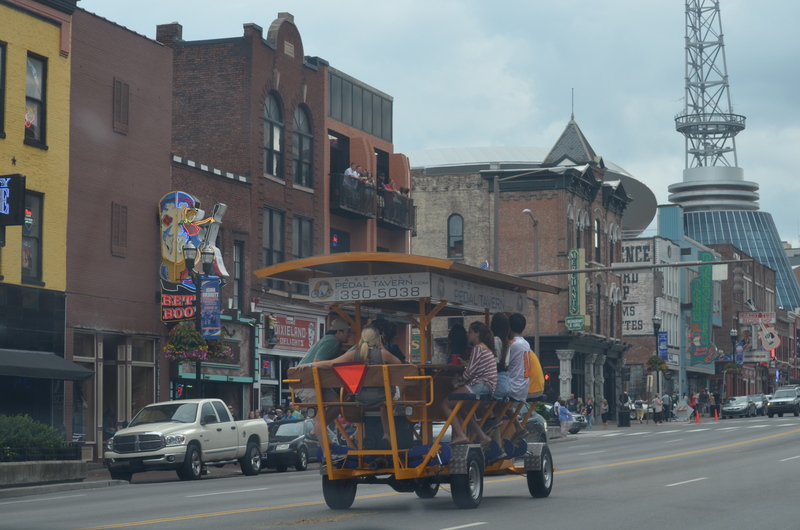 We took the carriage ride around the historic area, a great way to get an overview of the history and the city. In the evening we walked to the pier, where there were porch swings and benches to watch the ships come in and the sailboats go by. Walking back to the hotel through the twilight streets, there was a quiet calm. Any parties in this city must have been private and inside on this particular evening. 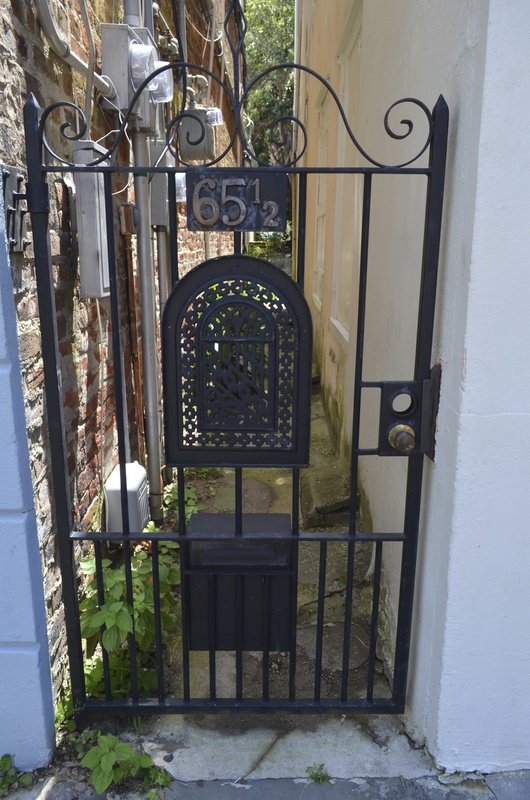 Charleston seems the most gentile of the cities we visited. It wasn’t formal particularly, as ladies wore cool cottons and linens with hats to shade their faces from the sun and heat. It wasn’t as hot or as humid as it could have been, lucky for us. 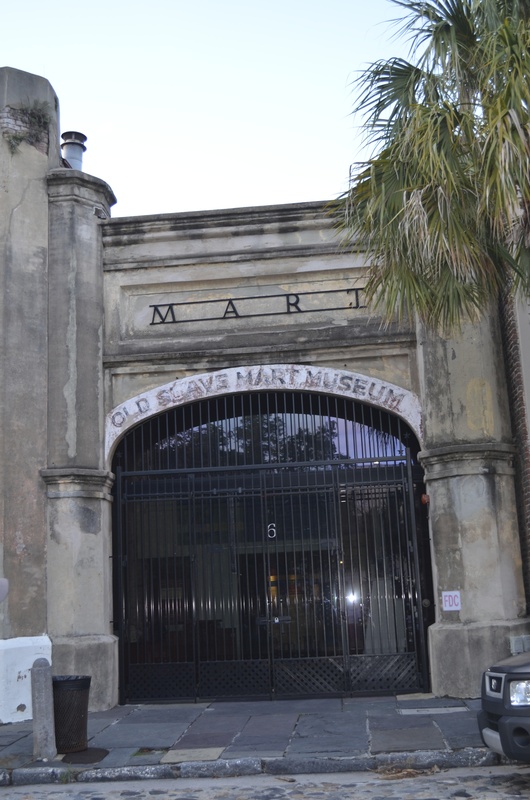 The next day, I toured the last remaining Slave Market Museum, a small but sobering visit. 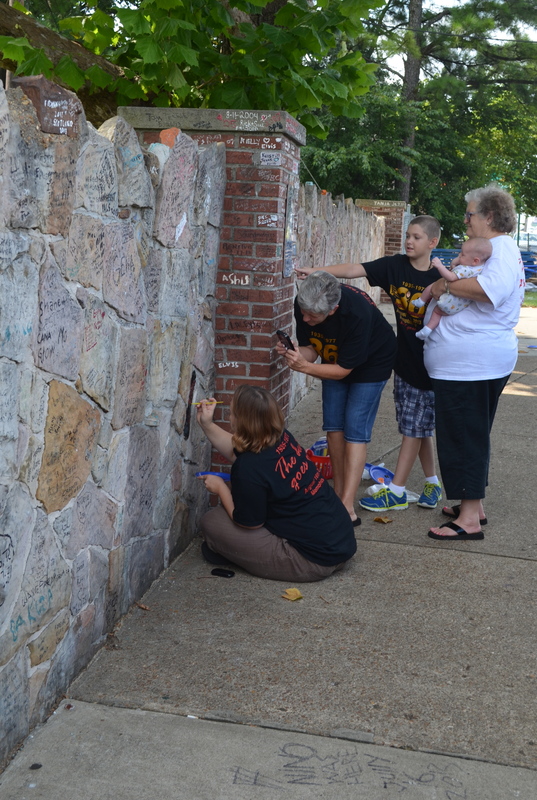 Among the others there was an older African American woman and her daughter. She was just sitting in front of one of the displays. I had great respect for what her thoughts may have been. The man at the desk had told me it was pretty brutal, as it was. 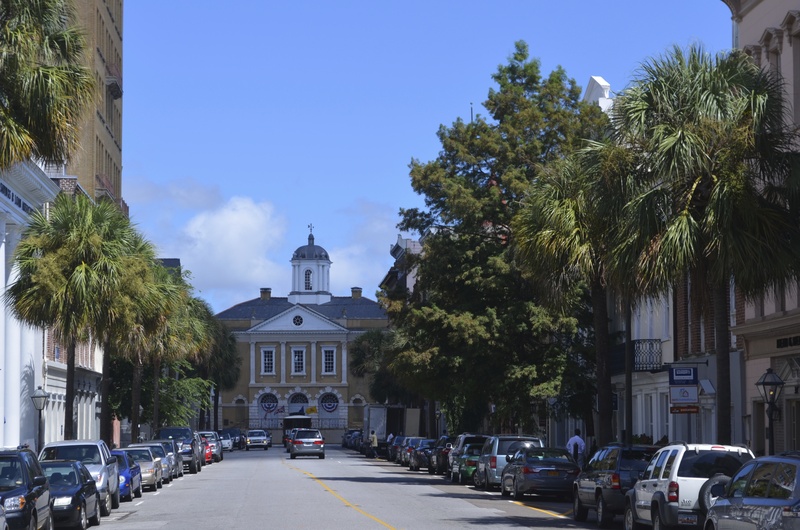 My memories of Charleston as a city are lovely. The food we ate was great, although we didn’t try any of the fancier restaurants. We took the trip around the bay, toured the city and I went to one of the plantations outside of town. 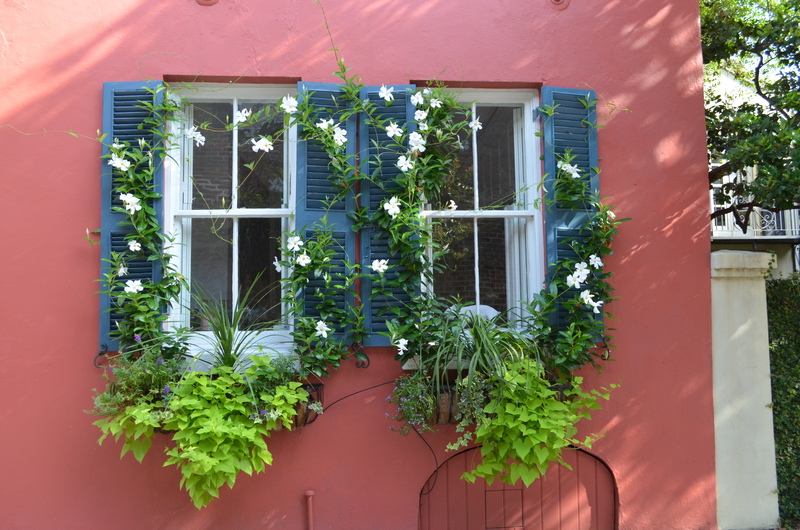 Our two days leave me with visions of beautiful gardens, flowers and well-kept homes. 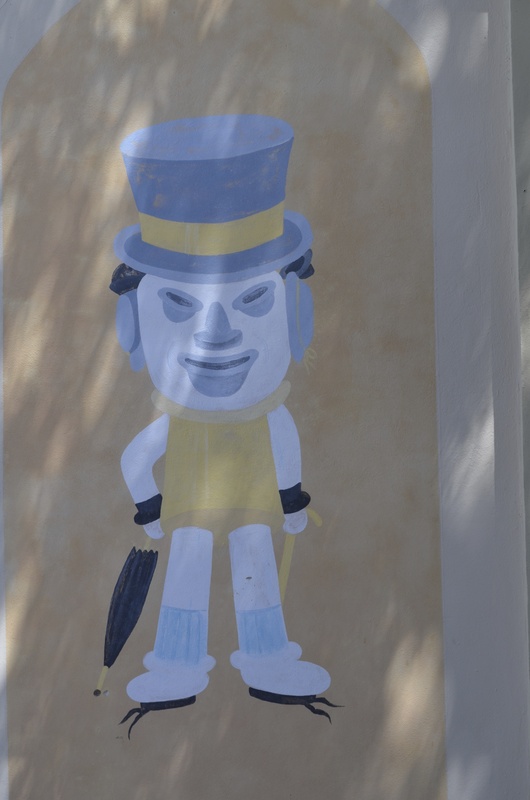 I love the Charleston Hat Man, a painting that was uncovered and said to be painted in 1892 to advertise the haberdashery inside. There are 16 hats that make up the man. 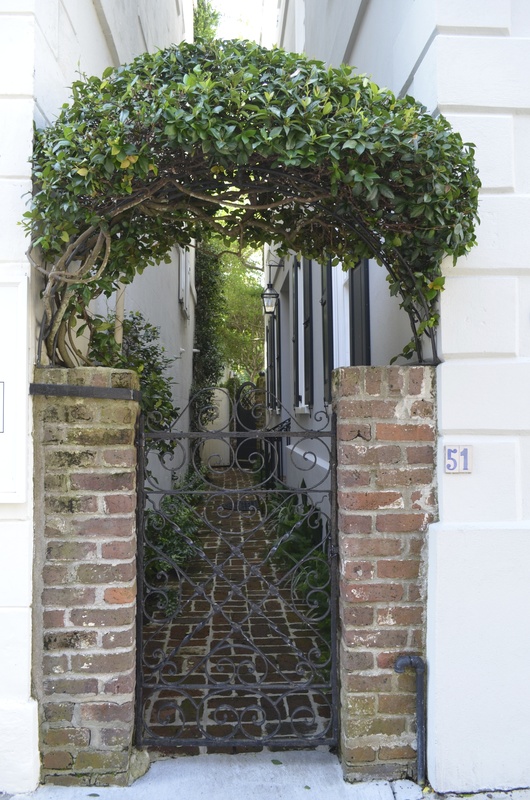 Charleston is everything you ever imagined about Southern charm. 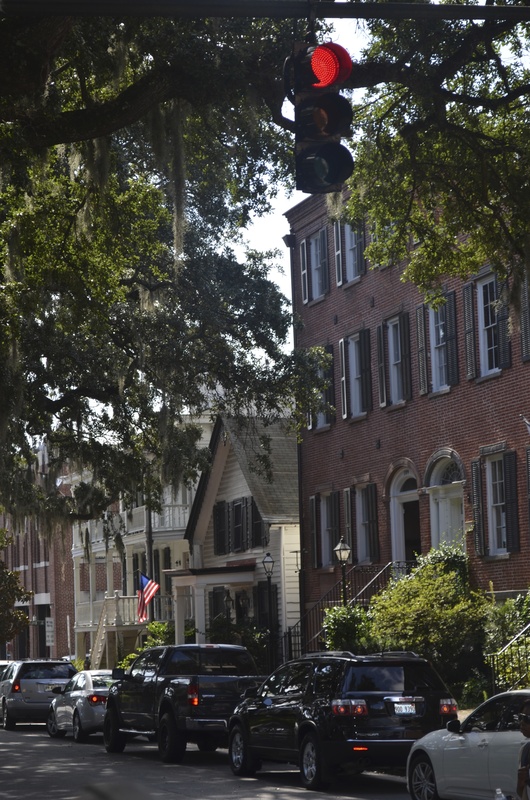 Our next stop was Savannah and we arrived late in the afternoon, in time to find a hotel and meet people for dinner by the river. This was a change from Charleston. The riverfront was busy with tourists and partygoers. I noticed that one of the popular t-shirts for sale was of all the pubs in town. There were batchelor party and batchelorette party groups one night. 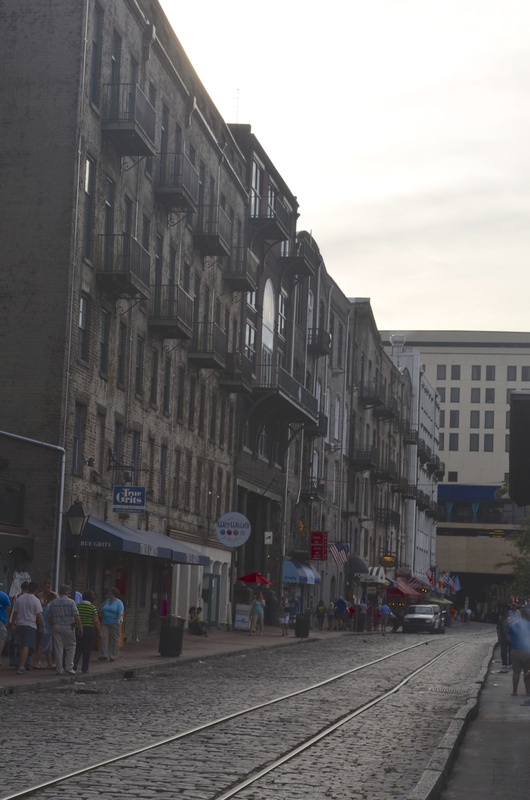 This was an old port town and the riverfront area is where they goods were purchased by brokers. Although you have to walk down steep ancient stairs and walk on cobblestone and old brick streets, it is a city that introduced itself to us as a fun place to be. 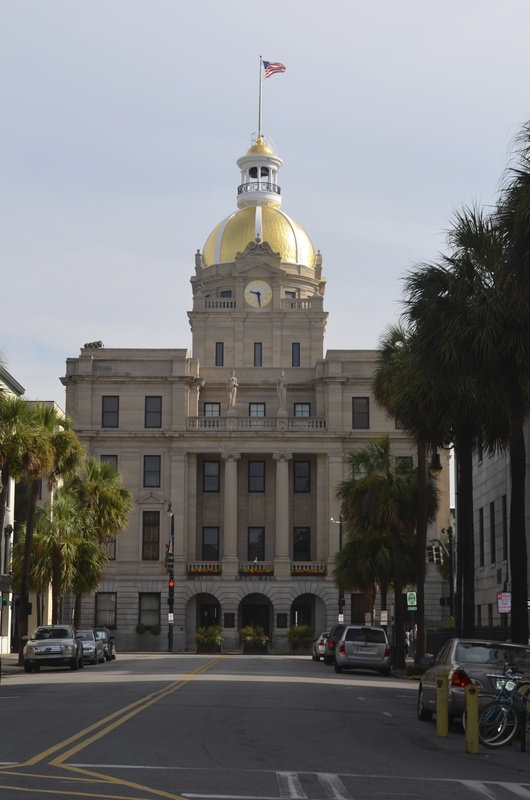 The next day, we were treated to a trip to Tybee Island, a stop at Ft. Pulaski, a boat ride along the coastal waterways with lunch at a small Jimmy Buffet-like restaurant, and a return visit to Bonaventure Cemetery before it closed. 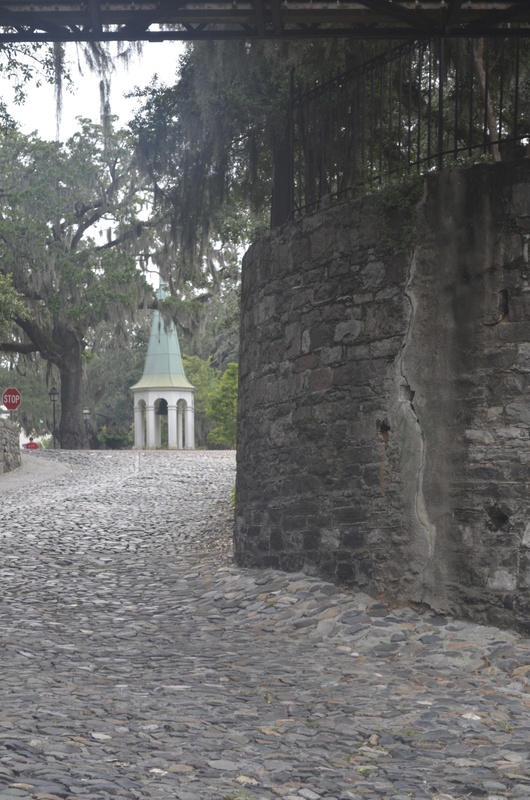 The cemetery was made famous by the novel and movie “Midnight in the Garden of Good and Evil,” and it lived up to its mysteriously beautiful reputation. We visited the graves of Johnny Mercer and his family and left before we got locked in for the night. Our hosts said they picnic and ride bikes there and have been to a Halloween event. 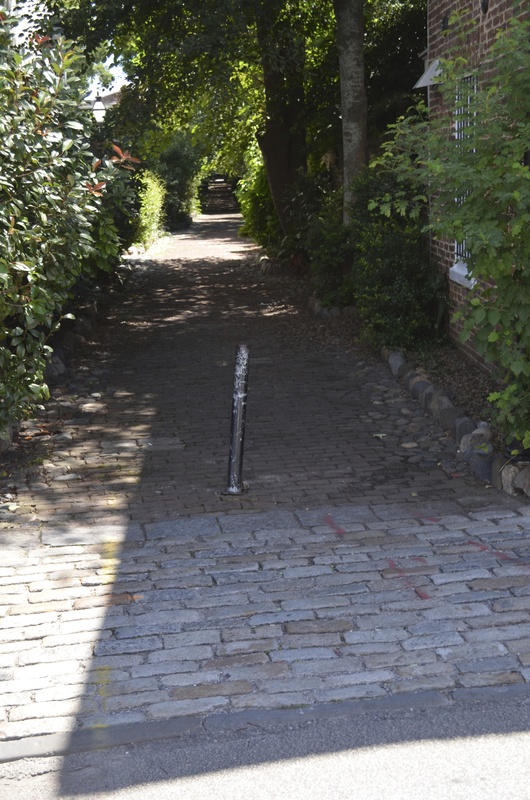 I was beginning to see why the tour companies offered ghost tours of Savannah. 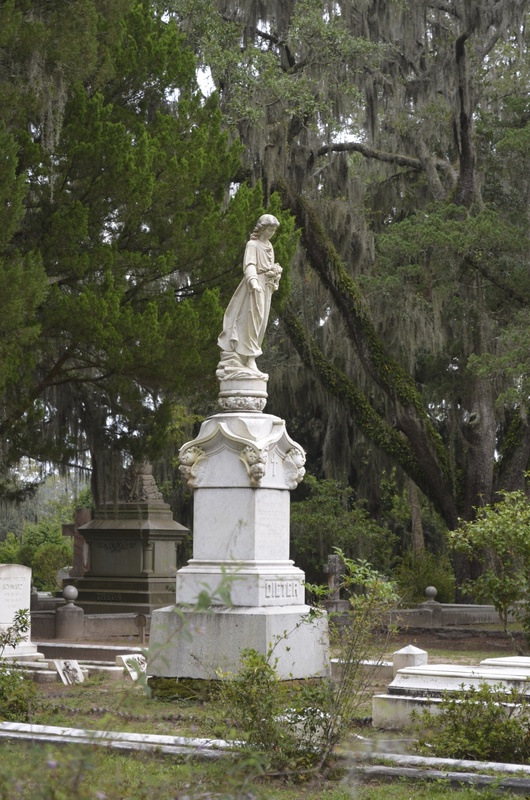 With the pirates and specters of the cemetery, there was an edginess to the city. 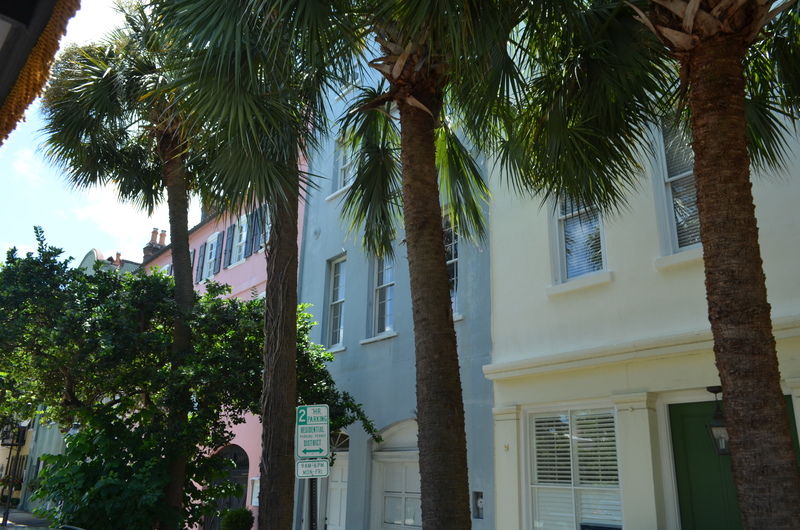 Our tour of the city showed us the lovely homes built around 22 squares. 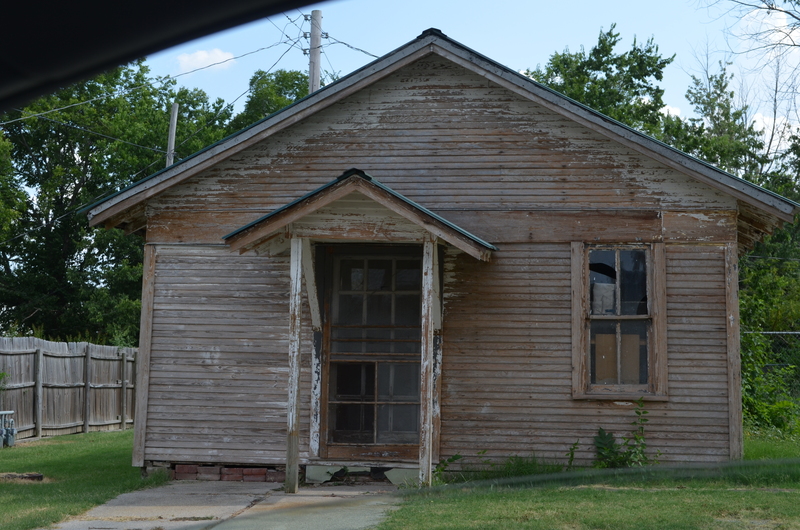 Historic Preservation finally came in the 1950s or much would have been lost. There were homes from all eras with a large Victorian area. 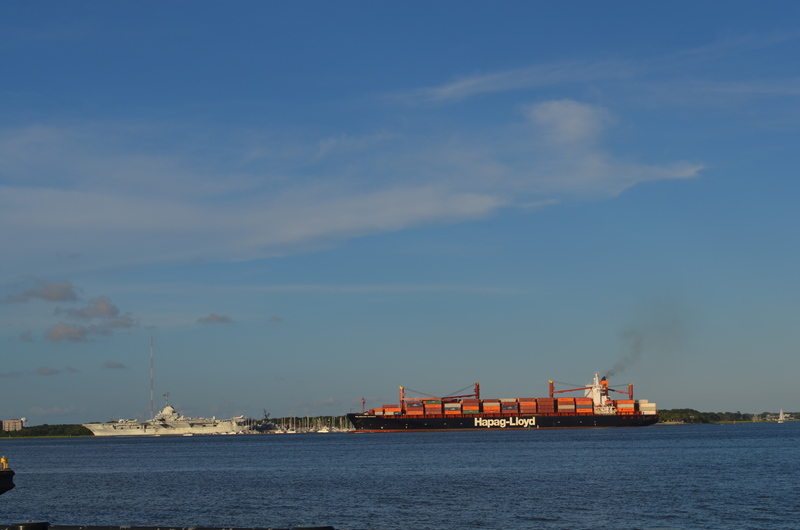 I left Savannah with mixed thoughts. 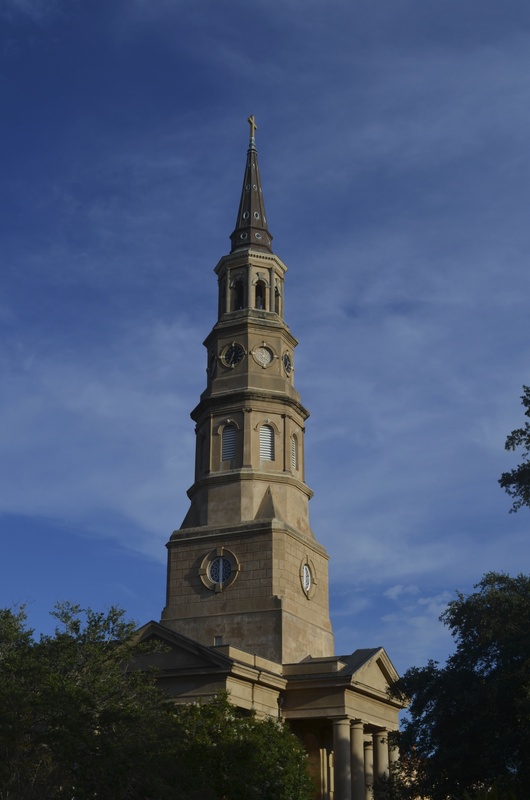 I had thought it would be more like Charleston, but it has its own flavor and vibes. It’s a little darker, a little more mysterious when you see them both together. It’s a place to keep exploring, for sure! Our final city was New Orleans. 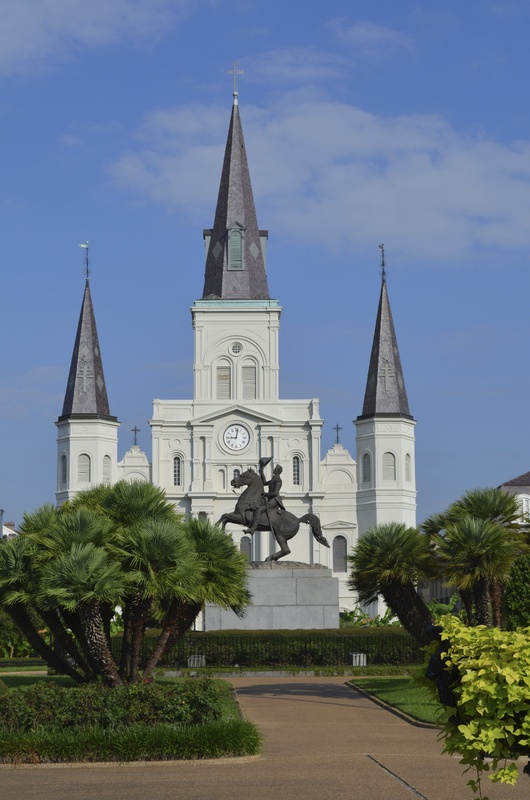 I have been to New Orleans many times. 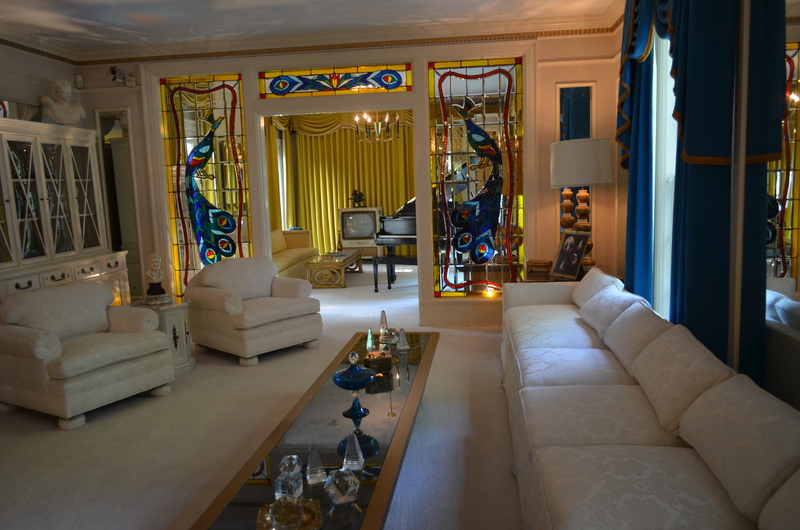 My in-laws lived there for a long time and we visited in different seasons, went to the World’s Fair, Mardi Gras, and always loved it. My kids grew up knowing this city. 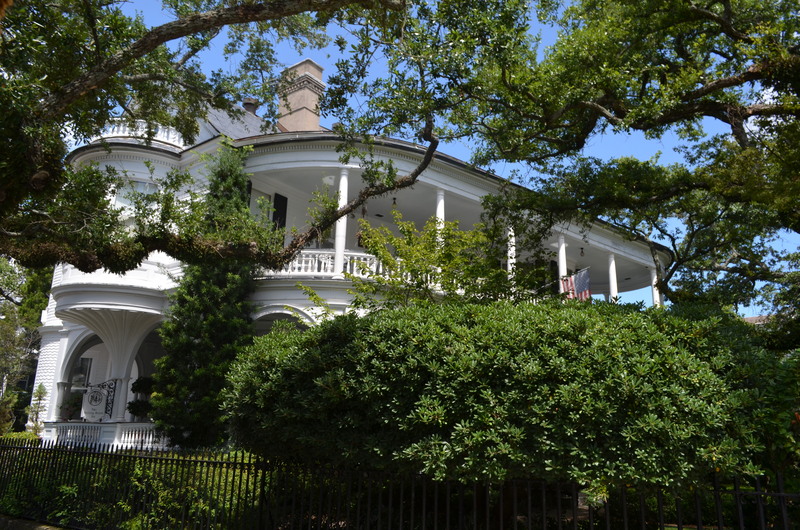 I hadn’t returned since Hurricane Katrina, so I was anxious to see how it looked. 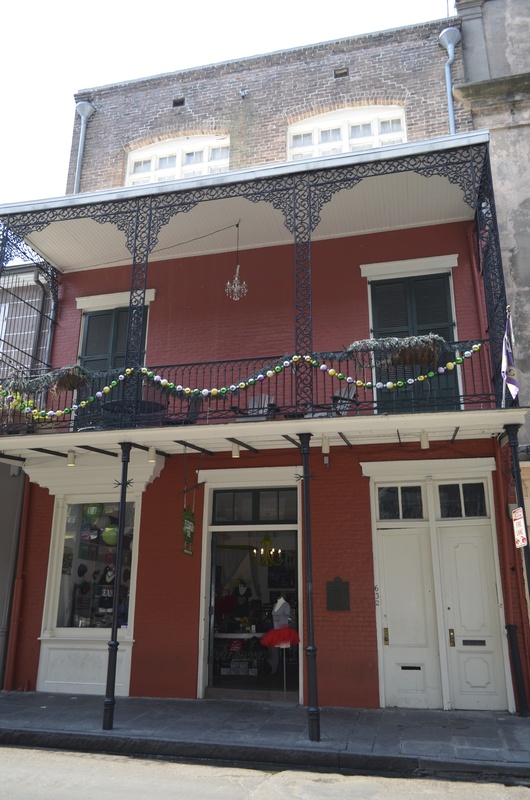 I have found out since I had been there that my great-great-great-grandfather brought his family to live in New Orleans. 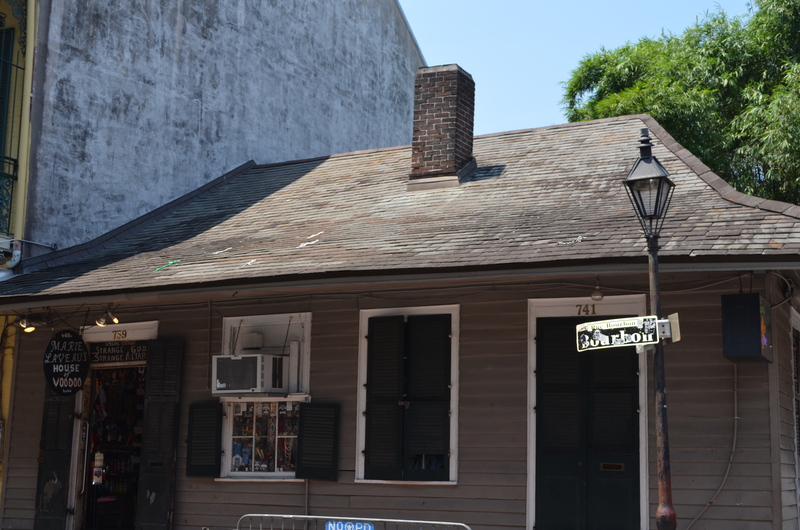 He was a physician and died while treating people during a Yellow Fever plague. Maybe there is some DNA in me that makes me love this place. 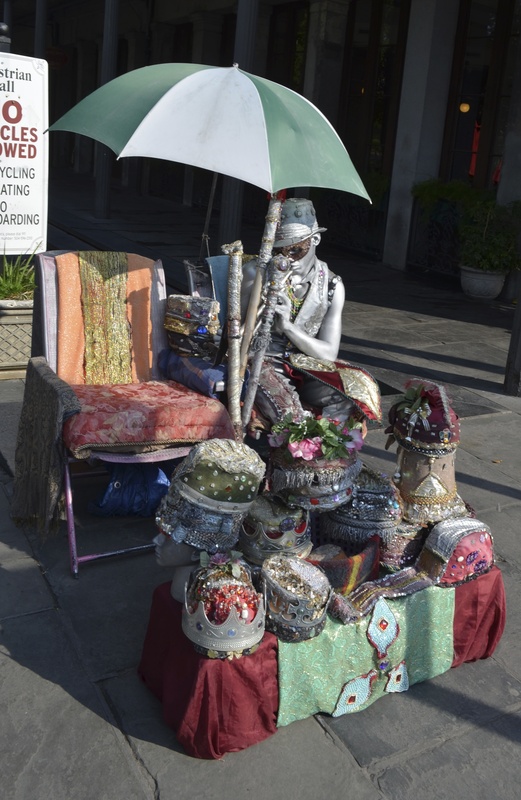 There is nothing like New Orleans. 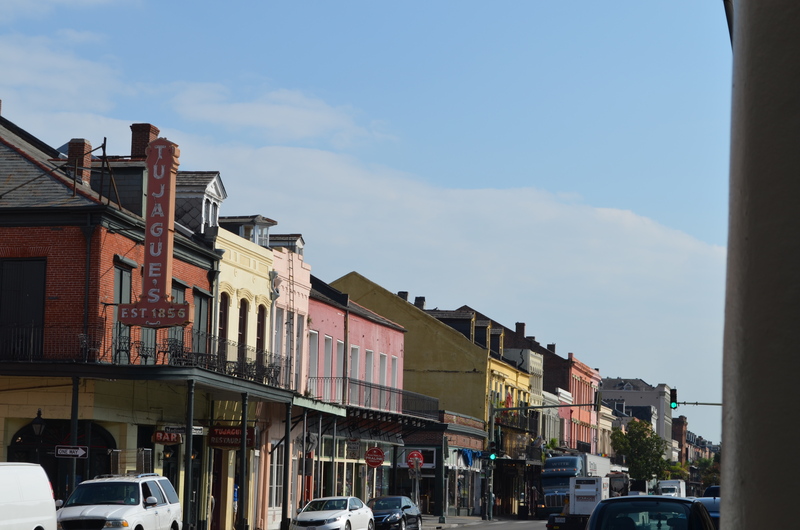 I loved all the other cities we’d visited, but New Orleans is just its own self. Some people don’t like the smell, but it’s just part of the place to me. 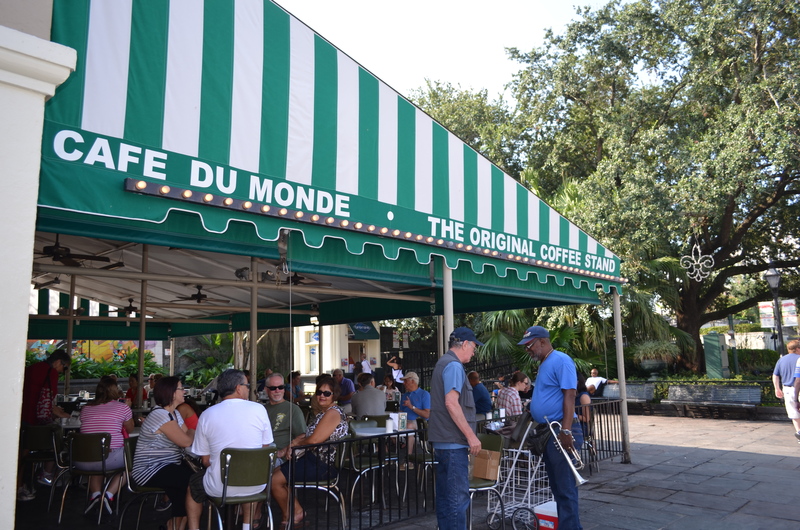 and headed for Cafe du Monde for beignets and coffee, I felt like I’d come home. I like the musicians, the artists, and the street performers. and I like the mixture of all the exotic cultures, French, Spanish, Italian, Creole, Cajun, American Indian and European Americans, that blend to make this city and influence its food, its music, and its vibe. You can’t walk up, so we bought our tickets, got our audio guides, and took the shuttle up the drive. This is how they control the never-ending stream of visitors. The house isn’t really huge, but the grounds are lovely. The neighborhood isn’t the best, but it fits. 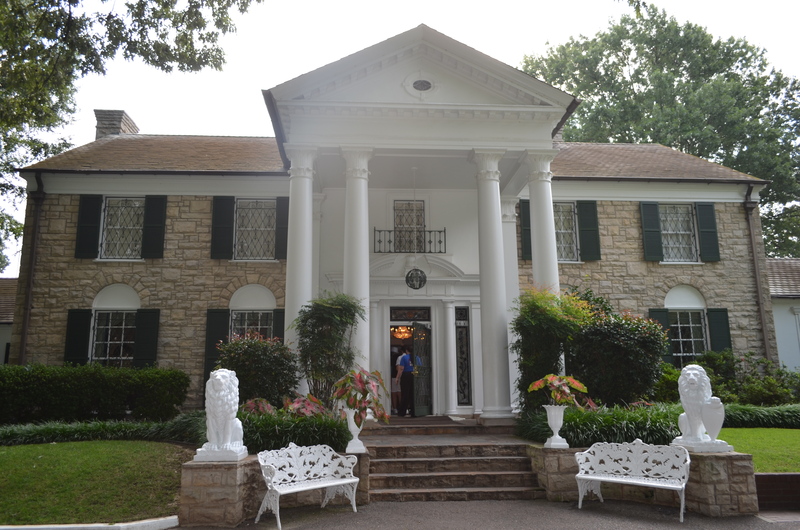 Elvis’s family reigned as the ones who came from so little to reach the top. My audio guide didn’t work, which was ok with me. 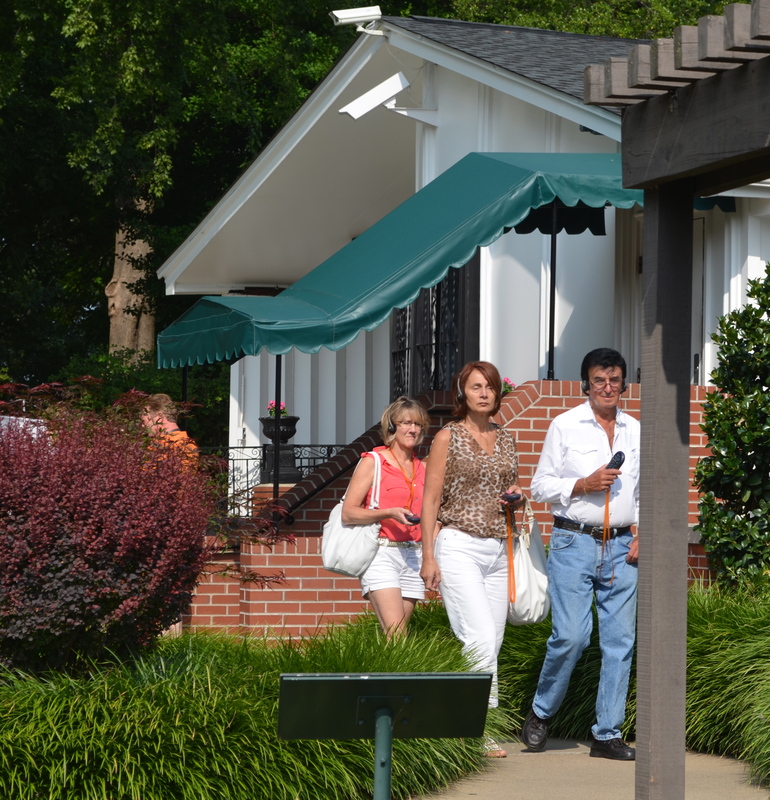 The effect of the crowd all listening to the guides creates a reverent quiet as you tour. Or, maybe they really were in that much awe. 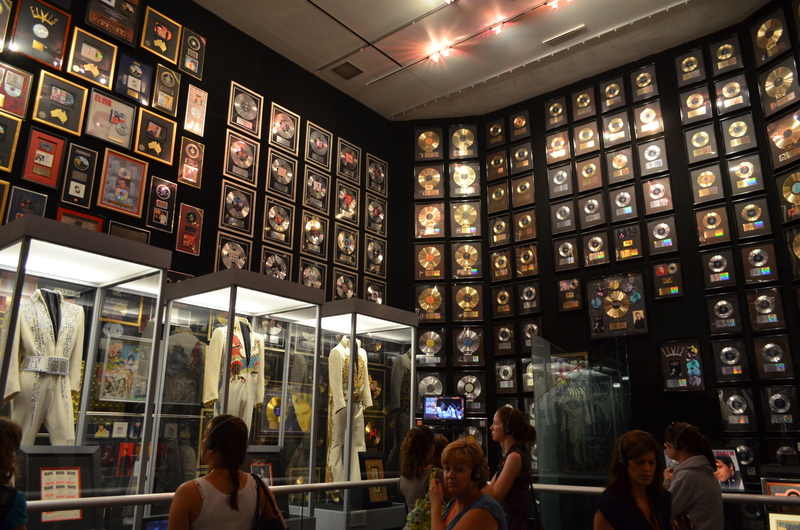 …then a room with records to the high ceiling, I had to wonder how many more came after he died. 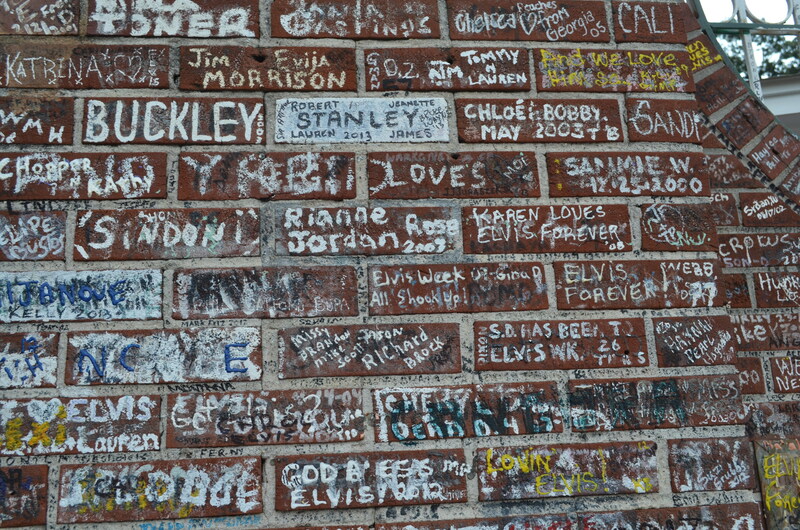 My favorite place is the wall outside where so many fans sign that they must have to clean it yearly to make room. 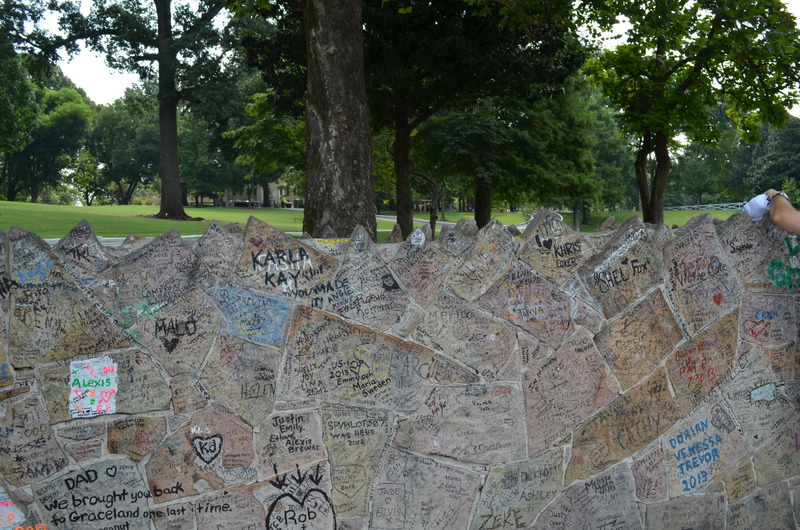 It’s a lot of “Love ya, Elvis,” like yearbook signatures of your past. 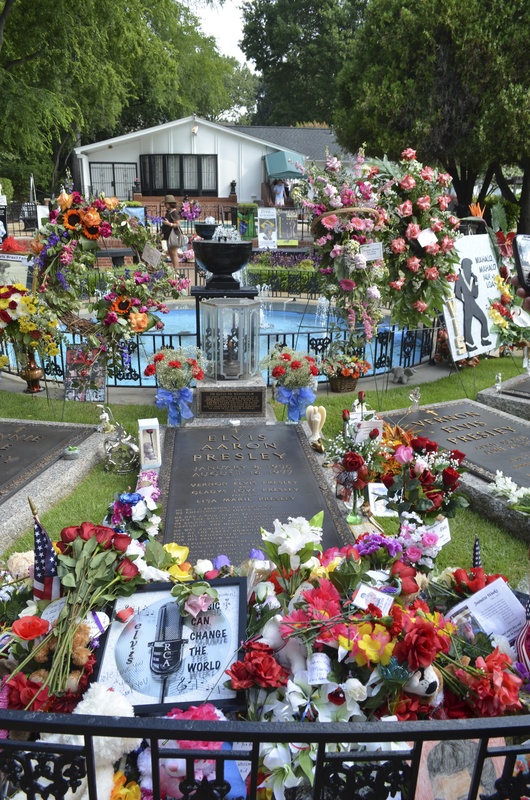 On the 36th anniversary of his death, I joined the mourners at his grave, reading the notes on arrangements from fan clubs around the world and tributes from individuals. 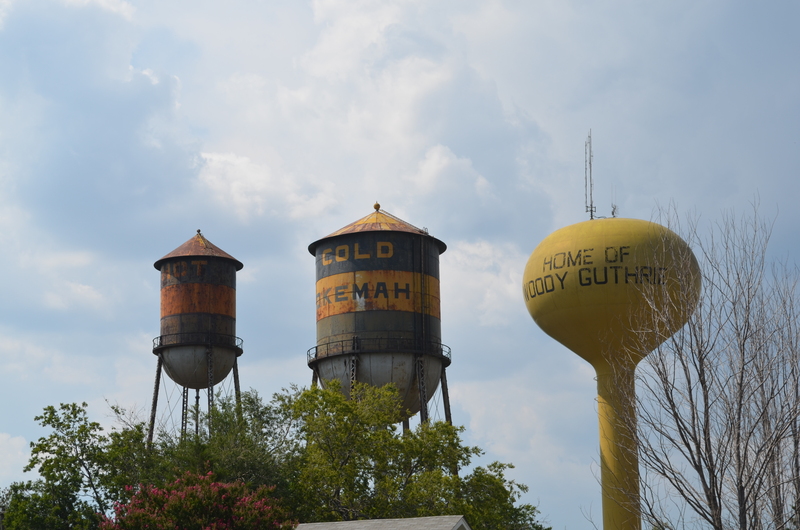 Last year I finally got to Okemah, OK, home of Woody Guthrie in his youth and site of the annual Woody Guthrie Festival. Last year was his 100th birthday celebration. It’s going on right now, this weekend, for his 101st! 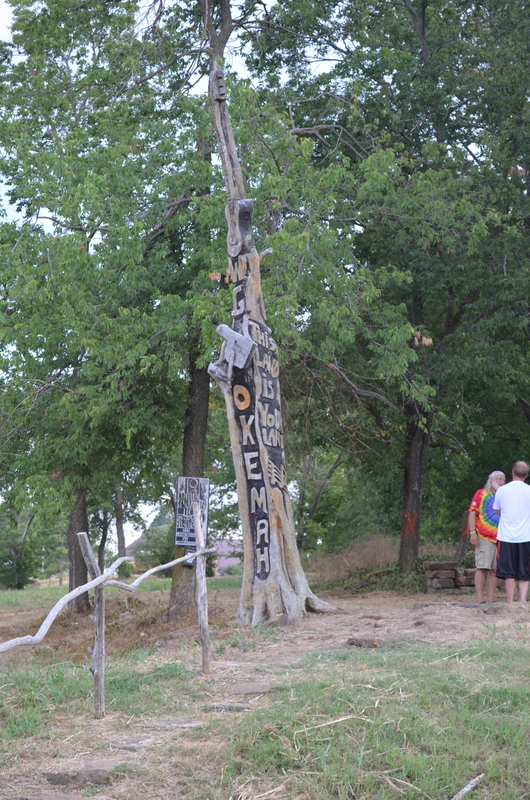 Somehow, I know he would like the way they do it up in Okemah! 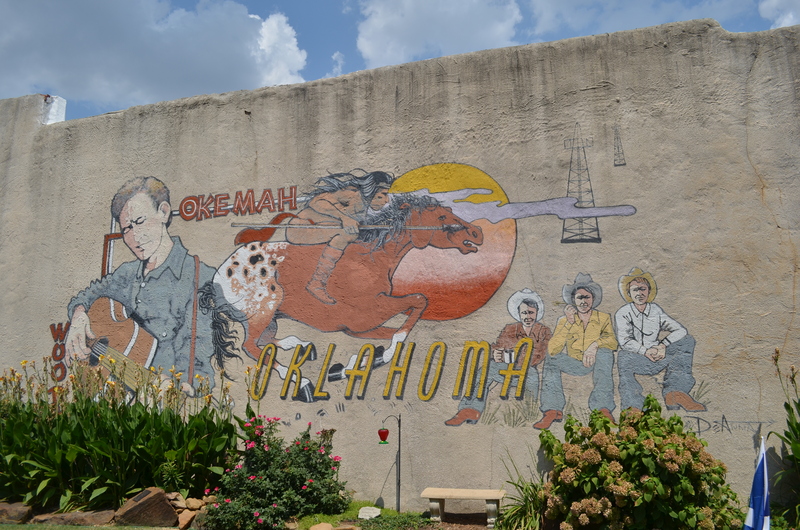 Okemah would probably be lost without their native son, whom they didn’t talk about for years because of his controversial ties to the Communist Party. Time heals and history becomes more clear and now they’re so proud of Woody and his roots. Rightfully so. 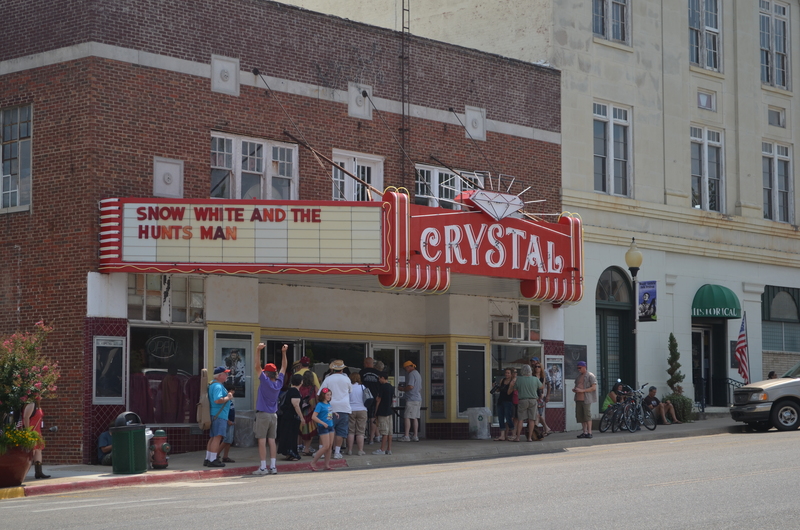 When you get out of your car on the Main Street, you can find someplace with a map…at least during the festival you can. You’ll want to see the park with the statue of Woody, probably life size. He wasn’t very big. 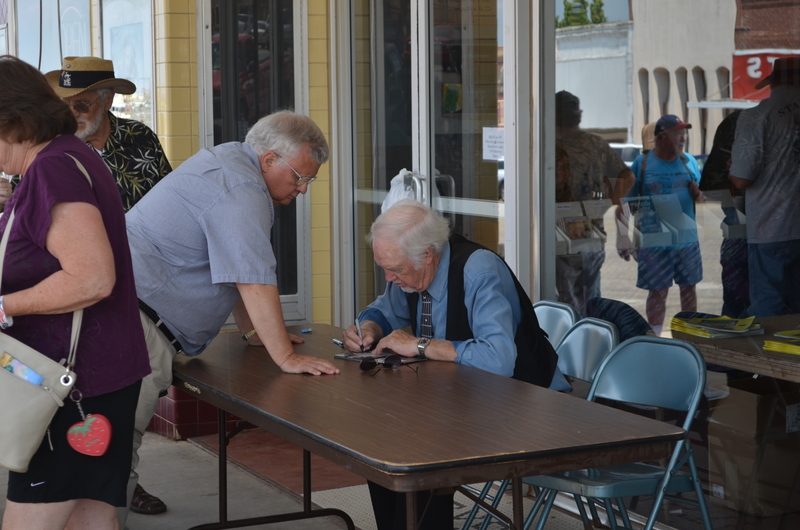 Last year I listened to Ronny Cox, movie star, musician, and watched him visit with fans as he sold his CDs on the hot street after he played. 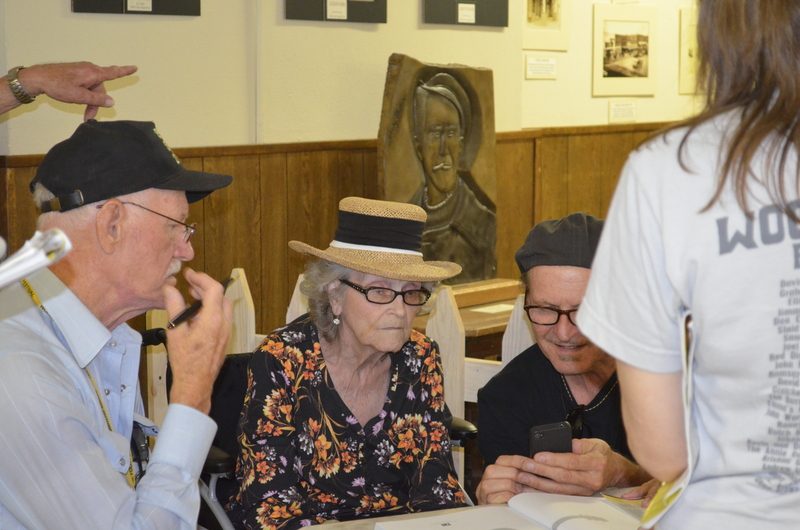 There were lectures from experts on Woody Guthrie and time to visit with his sister, who was a delight and had just written a book. Everything was pretty down home and friendly. 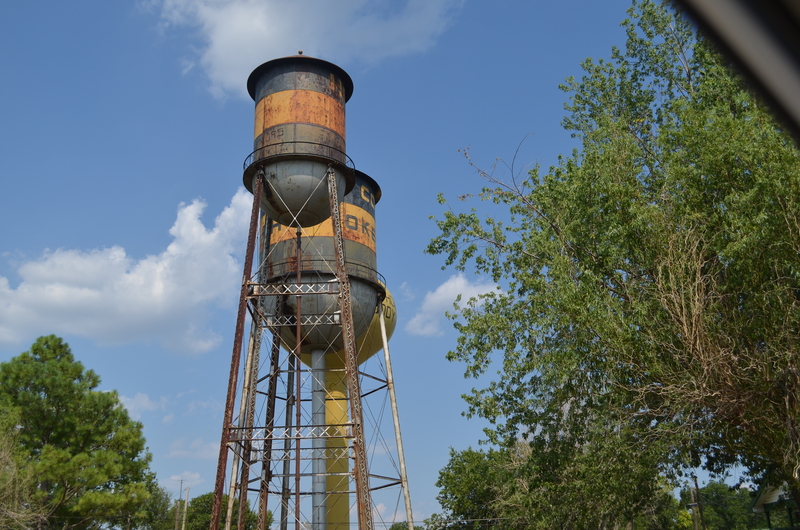 The unique water towers are also a source of pride and a move is on to restore them…or at least not let them be destroyed…who else has Hot, Cold and Woody Guthrie towers? In the evening, there are concerts in the Pastures of Plenty and RVs, campers, tents hold the faithful and the fans who wait for the cool of the night to listen to those glorious sounds. It’s a bit, a big one, of Americana that will surely touch your heart with its simplicity and its love for the messages Woody left us. 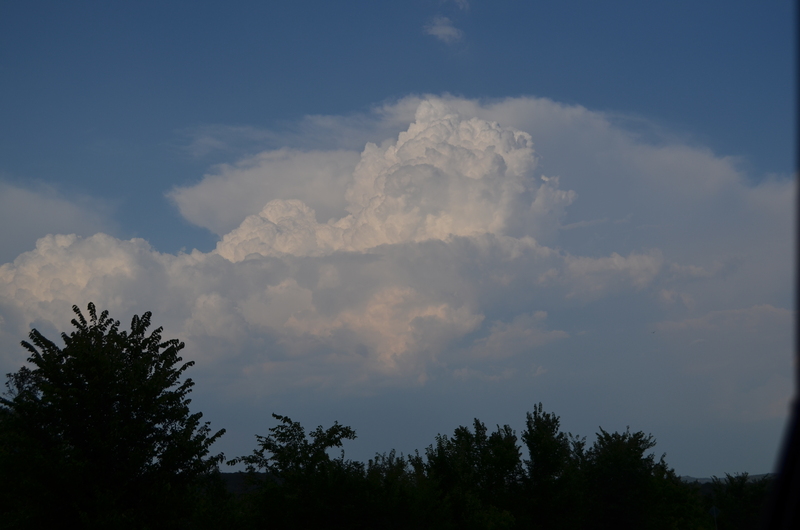 I headed home, stopping to watch a typical Oklahoma cloud forming on a hot July day, rising into the sky. This Land is Our Land. It’s been 49 years since I first saw Paul. 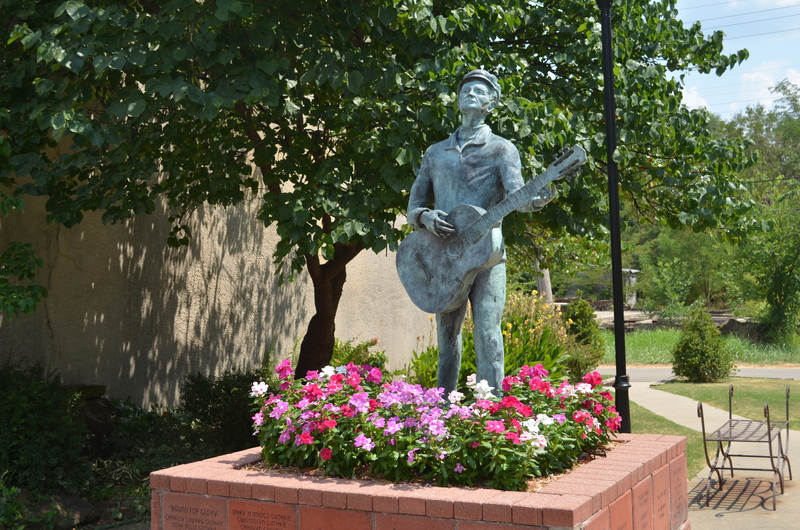 I was a freshman in college and he and his friends in the band with the funny name, The Beatles, were on Ed Sullivan and we watched him on a small television hanging out the window of our dorm to get reception from Oklahoma City to Stillwater. He was the cute one, the one who has always looked so young. Their hair was longer than the preppy boys we knew and even longer than the real cowboys studying at Oklahoma State University. We loved them. We wanted to hold their hand, yes we did. I love music – can’t sing at all but love to anyway. 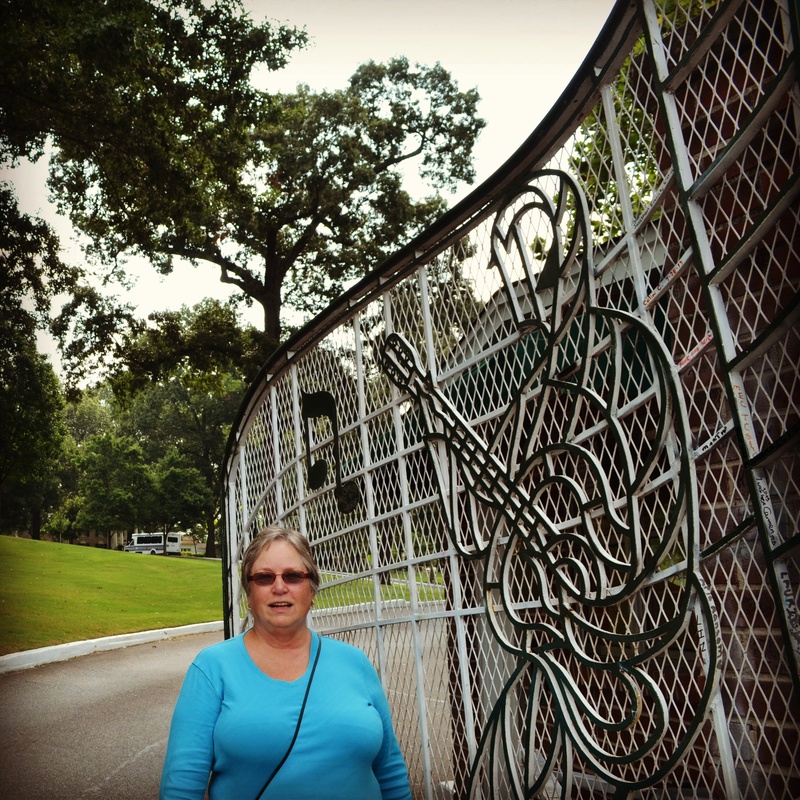 At that time in my life, I was equally divided between my love of folk music – Peter, Paul & Mary, Joan Baez, The Kingston Trio – and rock & roll. The Beatles came right after President Kennedy was assassinated, warping the innocent world we had lived in. They were fun, irreverent, witty, and talented beyond belief, a welcome respite from contemplating the horrors of the new real world. Their songs and the beat locked into our hearts. Love, love me do. After college, The Beatles and I moved on. I started having kids and being a kind of grown-up. I still listened to their music, but it got lost in Sesame Street and Burl Ives sings for children. They married and had kids, too. We all went on with our lives, but they were always there. They were such a part of our times, our culture and we lived every dramatic event with them, watching their music evolve just as all our lives did. They broke up just as the first of our friends were getting divorced. Their drama was our drama on public stages. The Beatles were the background of our lives, our youth continuing as we got older. Paul married Linda and lived and loved, just as many of us did. She got cancer, just as many of our friends did. She died exactly a month to the day after my husband died of cancer. Katie Couric’s husband died around then too…we all had the same sad bond. Life goes on and we all went with it. Earlier this year, I happened on a PBS special, “Kisses on the Bottom,” with Paul McCartney in the old Capitol studio singing an intimate concert of the old standards that his parents, my parents too, had listened to and included one new song, “My Valentine,” that he wrote for his new wife. It was such a wonderful concert, showing the man at his best and most gracious with other great musicians. 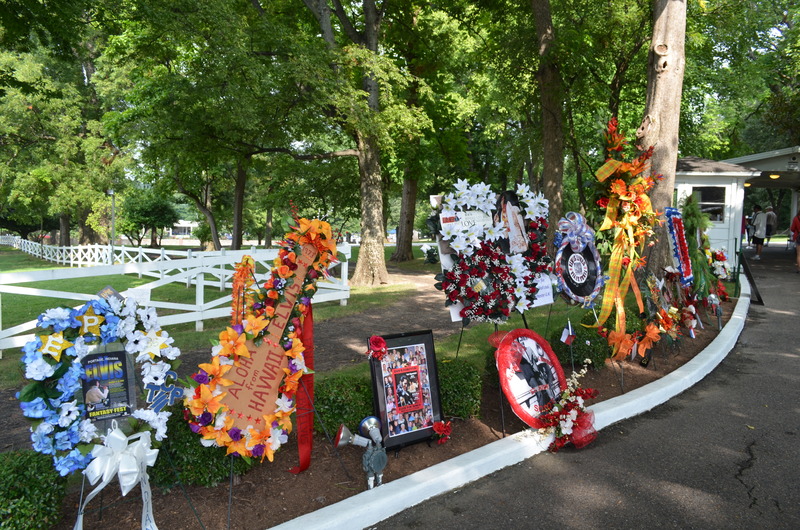 His generosity to other performers, his love of the music, his humor all showed in this wonderful hour. He sang my mother’s favorite song, “Always,” and touched my heart. I downloaded the album immediately and saved the program. When the announcement was made that Paul was coming to Tulsa, I grabbed a friend, one I’ve known since we were 9, and got tickets. A splurge – they’re not cheap – but a kind of bucket list thing. We were going to see Paul, one of The Beatles, in person! Last night was the concert. It was amazing, he was amazing. How many millions did it cost to design and create the incredible staging? Lights, video, photos, sound, a crew of hundreds. It took a long time to get in, we got a t-shirt because you had to do it, didn’t you? When he finally took the stage, it was instant rapport with the audience. He took a minute to drink it all in. 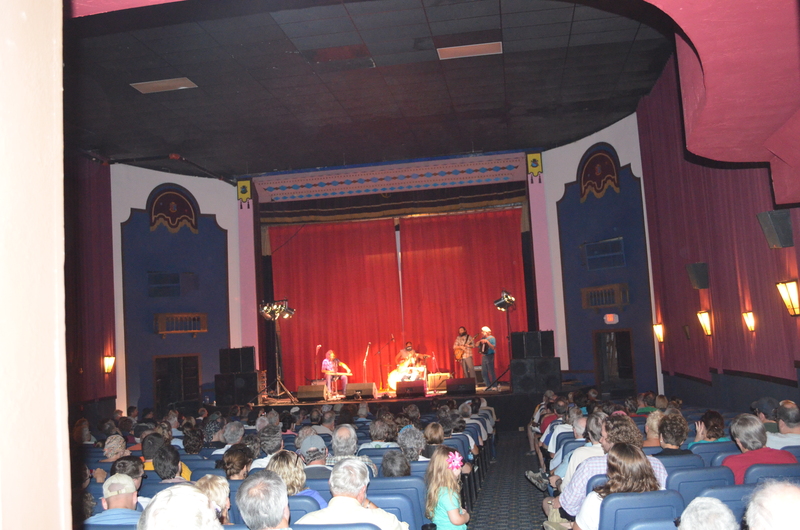 The show was incredible…the music, the fun! I took pictures with my phone, fuzzy but proof that I was there, memories of the evening. *Paul McCartney still looks like a kid. Granted, he looked older by the end of that incredible almost three hour show after never leaving the stage for over two hours and then returning for two long encores, but he looks terrific for 70. *He still seems to genuinely appreciate what has happened to him, is still a little bit amused and honored by it. This doesn’t come off as fake at all. He is very personable. *Paul is a fabulous musician, not to mention songwriter. Paul’s music is classic. He plays piano, lots of guitars, ukelele and plays them well. *This is what rock & roll is all about. He is great, a real rock & roller – he can scream with the best of them. Woo! *He appreciates his audience and never quits thanking them, acknowledging them. This is a sign of an accomplished pro who knows what it’s all about. *The songs of our youth are locked in our brains and hearts. 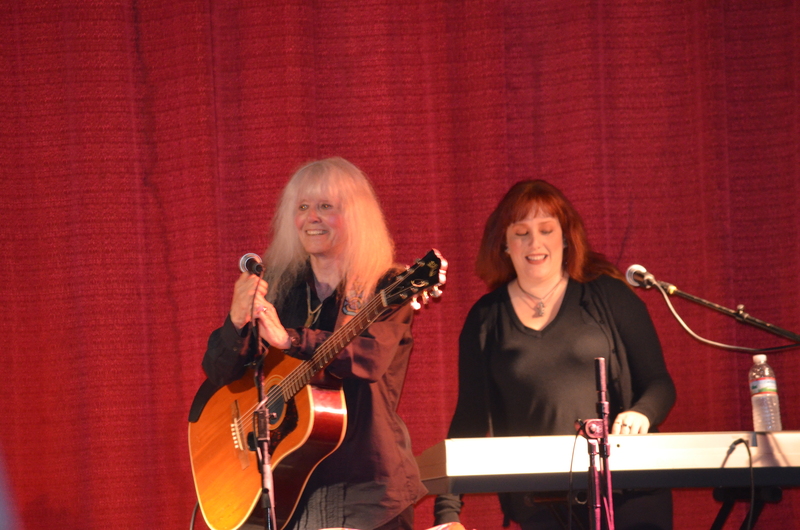 You may not have heard them for decades and all the words come back and you sing along. I can’t remember much of what I hear today – some is great, some just doesn’t stay with me. *The concert was not just old people, but all ages. What fun to share with your kids and grandkids or with your parents and grandparents. 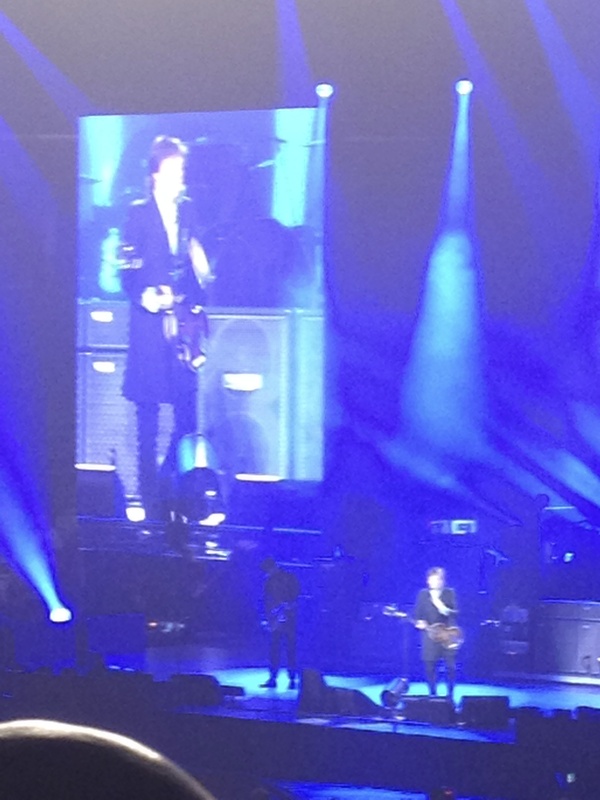 *Paul sang for his new wife, “My Valentine,” sang a song he wrote for Linda, sang for John and George. I was touched when he turned to look at photos of George while singing. He didn’t have to do that, but seemed to want to see his old friend, to remember. *This concert was not an old man doing the music that made him famous. This was a concert that seemed new and fresh even with old songs. Music for the ages. *I had the feeling I was in the presence of greatness. He IS a legend after all. So, after the pyrotechnics during “Live & Let Die,” the thrill of the crowd singing “Hey Jude” at the end before the two encores, we left the concert after 11:30 and headed home. Thank you, Paul. You are just so dang cute! Maybe cuter than when we met when I was 18. 49 years ago. When you’re watching your grandchildren grow up, you can’t help but compare their lives to yours at the same age. It’s always jarring to look at a picture of yourself and realize you look as old fashioned to them as your grandparents did to you. You only hope that they can look past that and learn from your infinite wisdom, also hoping you have any. When I was in 7th grade, junior high then, most of us started social dance classes. 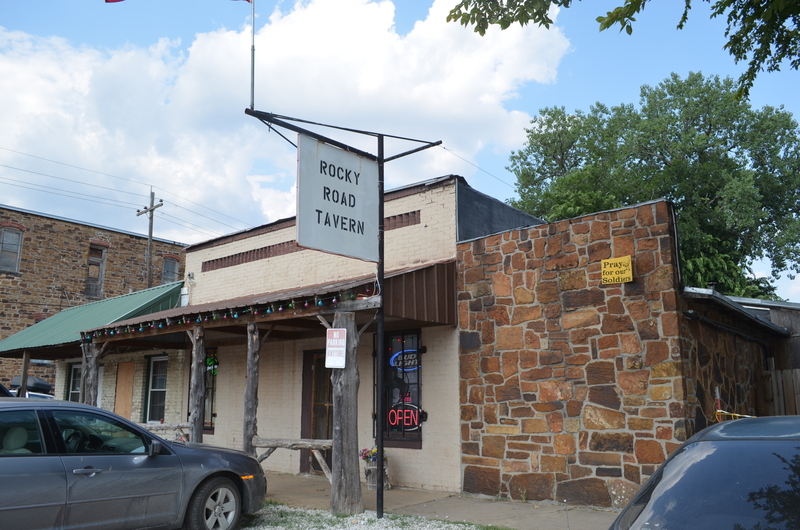 Other communities had similar places, but, in Tulsa, we had Skilly’s, where we first learned etiquette. They seated the boys on one side and the girls on the other and the boys had to learn how to walk, not run, across the room and politely ask a girl to dance. That was palm-sweating, nerve wracking, embarrassing and, yet, we all learned to be gracious. Not only did we learn to dance – fox trot, waltz, swing, cha cha – in the basic class, but they had dances for us to get real practice. This is me in 7th grade at one of the dances. Since I started junior high at 11, I must have turned 12 by this time, probably wearing my first heels, strapless dress and petticoats. We had lots of dances in junior high and high school. It seems like there was always something going on. We also had social clubs in junior high and high school for both boys and girls. The clubs had dances, the school had dances, there were dances after football games, friends had dances in their homes where we played our stacks of 45s and 33 rpm records. And rock and roll was growing by leaps and bounds, so we had great music, lots of local bands, and plenty of opportunities to practice our skills. We danced fast and furiously and we danced a lot. At least I did back in the 50s and 60s. New dances came out all the time. The Twist was our new favorite my senior year. As with most things, there was good and bad in the clubs, which excluded some kids and involved voting on members, not all of which was pretty, kind or fair. But, we learned to organize and plan events under the helpful eyes of our mothers, we learned to invite people out, and we started dating. Dating started with dance school, social club and school dances with your parents driving. There was the giggling with your friends at school while you eyed the boy you wanted to ask you out. There was the cringingly painful waiting by the phone, literally waiting by the phone since we didn’t have either portable or cell phones, and there was the horror when someone asked you out that you didn’t want to go with. And, finally, there was the joy of having the right boy call or ask you out, followed by the awkwardness of being together and getting to know each other. No wonder so many couples went steady, which was when you were supposed to be exclusively with that boy or girl. At least you didn’t have to wonder about the dance. There weren’t just dances. We dated a lot. There were coke dates (casual dates to go get a coke and either get to know the person or just be together), movies, football games, basketball games, picnics, church events, and anything else we could come up with as an excuse to go out. Once you were going with someone, it wasn’t so much a date as deciding where you were going to tell your parents you were going. One time my future husband and I toured the Wonder Bread factory on a Friday night for a cheap date. I didn’t ever lie about where I was going, but I did end up other places, too. There was a lot of time until our Midnight curfew for most girls. I got to stay out until 1:00 when the dances ended at 12. We hung out with our friends, too. I spent a lot of time cruising with my girlfriends and even groups of guys. Nobody seemed to ask where we were going on those nights, so we just cruised all over town, laughing, listening to the radio, and looking for whatever Friday night would bring. American Graffiti was the story of my high school days, music and all. Anyway, I digress with lots of memories here. 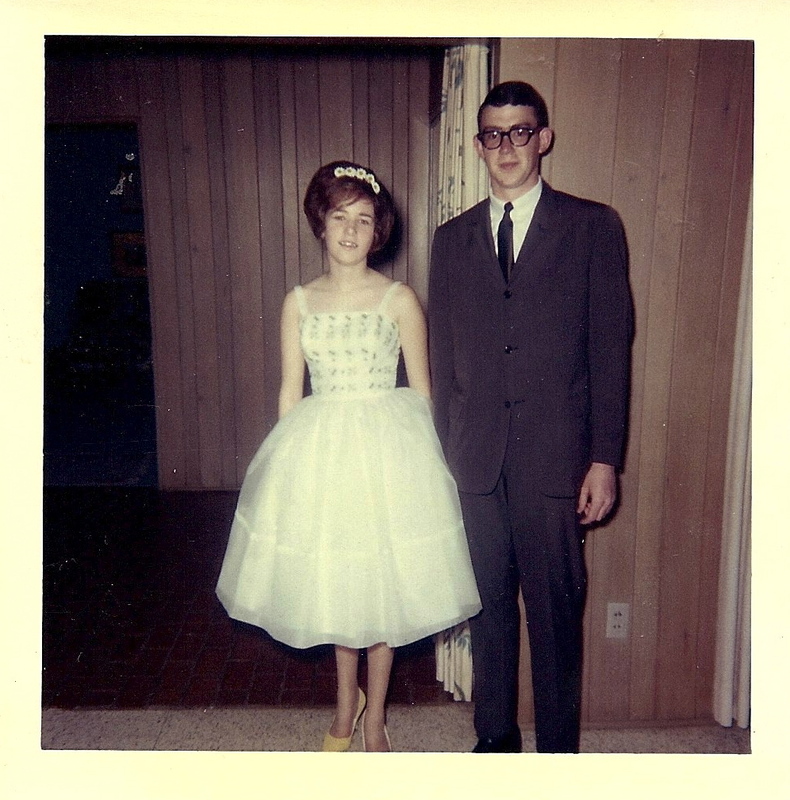 By the time we got to graduation, most of us had been on lots of dates of various kinds. 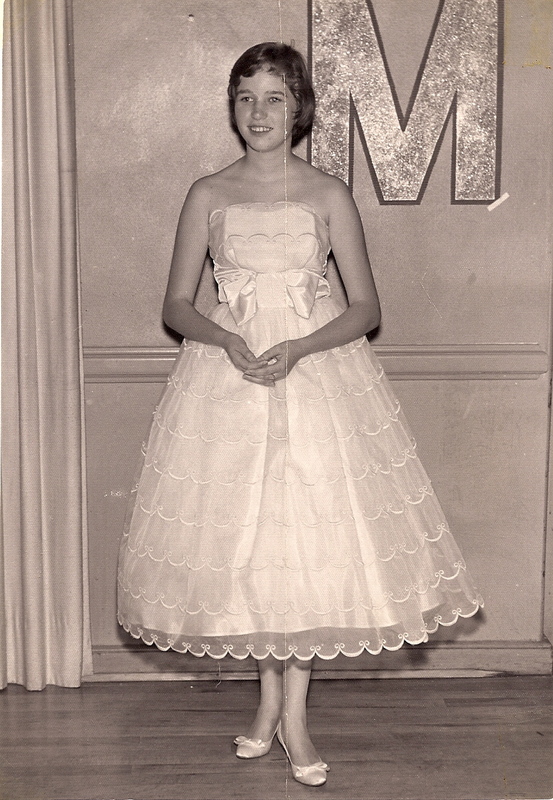 Here I am at what was called the Southern Ball, a high school sponsored dance, my senior year. 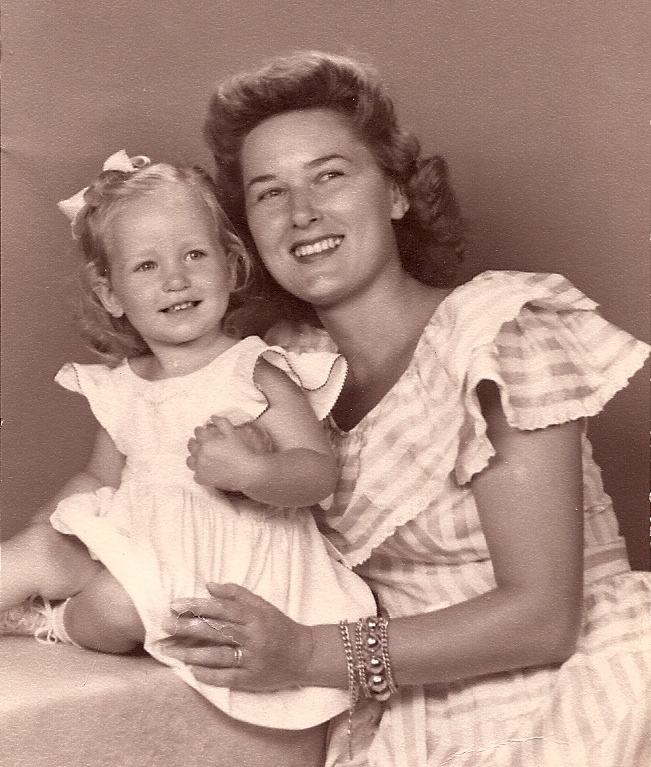 I had the dress and heels, had been to the beauty shop, because I know I could never have gotten my hair to do this on my own, and we were headed out. Rockin’ and rollin’ in the big heels and big hair. I think I still had my braces on – they came off right before my prom. 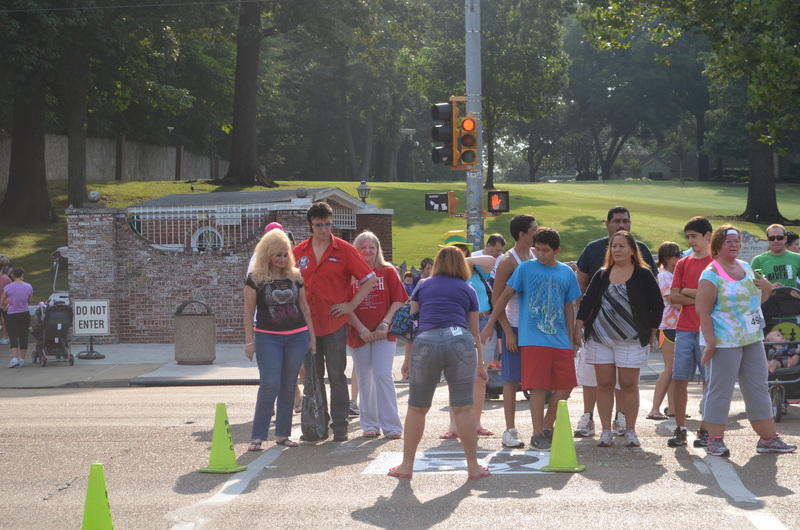 By the time we got to college, we were prepared as much as you can be to jump into the craziness of campus life. 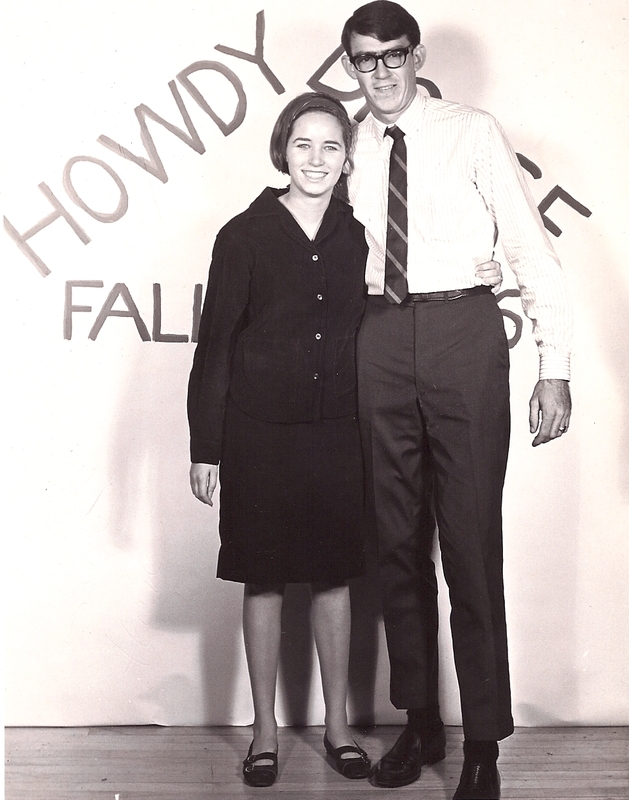 Here is a picture of my husband and me at a dance at Oklahoma State University a few months before we got married, my senior year. I love his high water pants – he had gotten out of the Navy that summer and grown a few more inches and his old civilian wardrobe needed some updating. But here we were, engaged and out on a date, going dancing as we had since we met. My grandkids don’t date as much. They have a few dances, which they hate because there are so many drugs and the dancing isn’t as much fun. At least we knew how to do close dancing as well as do the newest ones and anyone drinking was thrown out. Movies are expensive so that isn’t an every weekend option. There don’t seem to be places for all the kids to hang out and they don’t attend the school sporting events like we did. It’s a new world. I don’t blame their parents for sheltering them more, for keeping them home where there are movies and video games to entertain them. I don’t blame parents for anything. We all do our best to protect and raise our children and who am I to say what I would be doing today. I’m just an observer, looking through the lens of what was and what is. The word dating has a new generation meaning. Parents go on Date Nights, where we used to just go out with our husbands. The word dating is almost a euphemism these days. I never know for sure what they mean when adults say they are “dating.” It has shaded differences, for sure. I’m being nostalgic as I remember the fun we had, blocking out the bad dates that also came with the experience. I hope my grandkids date with more than texts and emails, explore meeting different people and falling in love in the best of ways, not matter what they call the process. It’s all about learning to be in relationships where we feel the most comfortable and loved and have the most fun life can offer us. I wish everyone finds that, at least once in their lives. Today I was in the check-out line at Sam’s Club and watched a man holding a little boy talking to the elderly woman behind him. Then he had the boy give her a high five, which was cute. It also made me think of something my mother said when high fives were first getting started, “what will happen to shaking hands?” She wasn’t against high fives, but she saw the writing on the wall as to the next generation of greetings. Little boys were taught to politely shake hands when they met adults in the old days. Then, the line being slow, my mind went to her lessons in manners. And the music started in my head. 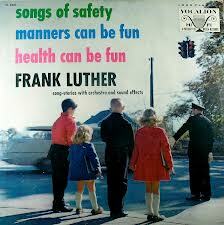 She had a record, a 78 rpm, called Manners Can Be Fun by Frank Luther. I looked him up and he was a country singer, songwriter, etc, who gained a lot of fame with children’s records way back when. The record was based on the book of the same title by Munro Leaf. Anyway, this was one of my mother’s favorites and we sang it all the time. She laughingly swore later that she played it for us in our sleep. And I can still remember all the words the minute the music starts. When I had my own children, I found the new version on 33 rpm, and played it for them. I hope it sank in – I’m sure it did. They all have good manners, although I’m not sure the parts about picking up their rooms was so effective as they grew up. I played it for my 3 year old granddaughter in the car the other day and she seemed fascinated as I watched her in the rearview mirror. Maybe it was the fact that I was singing along and knew all the words. If I ever want her to know her great-grandmother, this is the perfect way to start. Hope this link works so you can enjoy it, too. I started my morning watching the incredible Paul McCartney’s “Kisses on the Bottom,” originally shown on PBS Great Performances. One of the songs he sings is “Always,” which was my mother’s favorite song. She sang it to us as a lullaby and then sang it all the rest of our lives. The lyrics make me teary…”I’ll be loving you, always. Not for just an hour, not for just a day, not for just a year, but always…” I hear those words when I make my bed the way she taught me, when I look at my own children and grandchildren. I always smile..
Today, I’m having breakfast with friends from Kindergarten, grade school, junior high, high school, college. We’ve been through playgrounds and birthday parties, boyfriends and proms, classes up through college, marriages and divorces, births and deaths. We laugh, share, gossip, cry and wrap our arms around each other. These are Always friends and I treasure them. We mean more to each other every year.